The staggering 155-metre Streets of Monaco yacht is expected to cost over $1.1 billion to build and is modelled on a section of Monte Carlo. 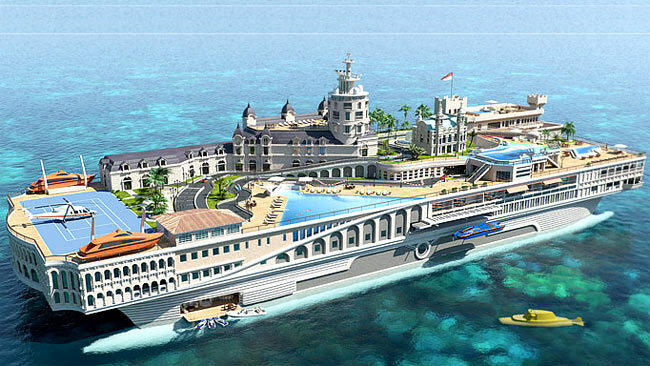 Currently in the design stage, the super-ship will feature smaller versions of the state’s famous landmarks such as the Monte Carlo Casino and racetrack, as well as swimming pools, tennis courts, a cinema, a go kart track and a Hotel de Paris. Instead of traditional decks the one-of-a-kind ship will have buildings, and instead of a swimming platform it will have a beach. Travellers will also spot waterfalls, a swim-in Jacuzzi-bar, helicopters and submarines on board. The one-of a kind ship could be home to 16 guests and 70 crew with the main apartment spread over three floors and 445 square metres. Linking upper and lower living areas is the Atrium – featuring seven guest suites, a bathroom, bedroom, dressing room, reception and balcony. The idea for the super-boat, designed by Yacht Island Design, was sparked by car racing and developed into something more innovative. “It is basically a floating city,” company director Rob McPherson said. “The design theme called for a unique yacht that reflected the style and sophistication of the principality. The ship will exceed the $1 billion price tag reportedly paid by Roman Abramovich for his Eclipse yacht. A second creation by Yacht Island Design will be a smaller 85-metre yacht based on a Pacific Island theme. The Coast Guard encourages owners and operators of vessels anchored or moored in cold weather to conduct preventative maintenance in anticipation of severe winter weather conditions. The Coast Guard is providing this information to the public after responding to three vessels which sank at their docks, while moored, due to heavy rains. Pollution violations caused by sunken vessels could result in fines and salvage costs. A maximum civil penalty of $40,000 per day or up to three times the cost incurred by the Oil Spill Liability Trust Fund may be assessed. Check local weather forecasts frequently. Be aware that storms can come up quickly and without warning. Cover and secure your boat. 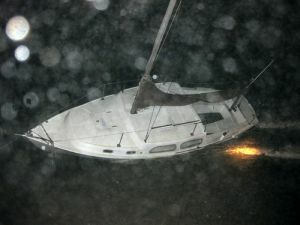 Heavy rains can flood boats causing them to sink in extreme cases. Check the shaft packing for excess leakage. Perform routine checks for signs of loose or deteriorating planks on wooden hulled vessels. Conduct a routine inspection of your automatic bilge pump. Visually inspect all thru-hull fittings for damage or loose connections. Remove all unnecessary fuel, designate a caretaker, and leave contact information with the harbormaster if you are planning to be away for an extended period of time. These simple steps can prevent damage to the environment and personal property while limiting man hours and taxpayer dollars spent on avoidable incidents. BoatU.S. Towing App for Android. Now Updated! Get the App that revs up the fun factor in your boating lifestyle! BoatUS – THE Boat Owners Association of the United States – knows boaters like to share with friends and family breathtaking cruising destinations, the hottest fishing holes, ‘uh oh’ grounding spots to avoid and best of all – their boats current location. Use the BoatUS Towing App to easily send friends your phone’s GPS Latitude and Longitude with a Google map link. You can easily share your near shore boat location with a few screen touches. 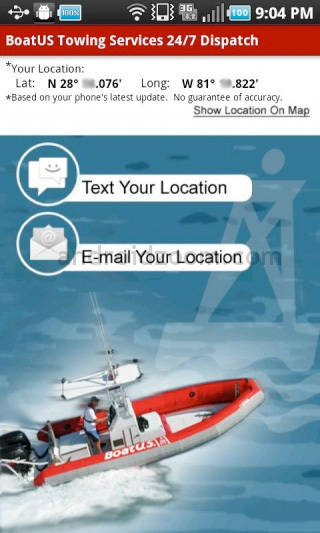 Even use it to notify friends on shore when and where you begin and end your float plan! BoatUS also knows boats break down, go aground and trailer tires blow out when least expected. Who wants to fork out over $600 for a tow? That’s why this App also has similar features to a vehicles automatic locator. Press the “Call for a Tow” option on the home screen and a 24/7 crew mate of BoatUS will answer, knowing who you are, what boat you’re on and where you are. A key feature, since tens of thousands of the boaters who call for a tow unfortunately don’t know exactly where they are located. Even though this app doesn’t replace good seamanship and navigation skills, it is a nice addition to add to your tackle box. And it’s free. The BoatUS Towing App not only displays the phones latest nautical Latitude and Longitude right in front of you, it’s GPS function should still work even when out of cell phone range. What a perk if you need to relay it over VHF radio in times of need! BoatUS Members who choose to buy Unlimited Towing are also prepared when the unexpected engine breakdown, non emergency tow, soft ungrounding, battery jump, fuel delivery and/or trailer roadside assistance is needed. 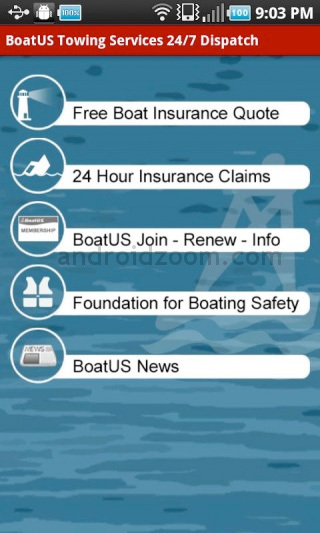 BoatUS can pay the bill on the spot so you don’t have to! BoatUS is the biggest, the best and the most trusted boat towing program available. Not to mention THE Association providing representation for recreational boaters on Capital Hill, the best boat insurance policies, 24 hour claims service, marina repair and fuel discounts at 900 locations coast to coast, rewards at West Marine stores, award-winning boating, fishing and trailering magazines and over 25 services for boaters needs. 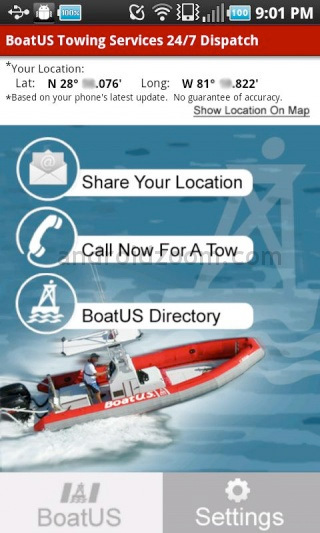 Download the free BoatUS Towing app today to try it out. At sea. On the Lake. In the River. On the Road. Also, call 800-888-4869 now to join BoatUS and buy Unlimited On-Water and Trailer Assist for less than you probably spend for your auto club. They don’t cover boats and usually don’t pay for tows of boat trailers! You may remember last November when a fire aboard the Carnival Cruise Ship Splendor disabled the ship off the coast of Mexico leaving hundreds of passengers stranded. There were no working toilets, no refrigeration, no hot water and no working galleys. The military dropped nonperishable items to the ship and the passengers were living on pop tarts, spam, and other yummy delicacies while the ship was towed by two ocean-going tugs to dry dock in San Diego. Now, according to the Coast Guard News, the cruise ship Carnival Splendor is scheduled to depart San Diego under its own power and head for dry dock in San Francisco Jan 19th, 2011. Carnival Splendor has been undergoing repairs for a fire that broke out in the engine room during the south bound leg of a Mexican cruise on Nov. 9, 2010. Repairs to the damaged components in the engine room have been ongoing since early November under the close supervision and direction of representatives of the cruise ship’s flag state of Panama, and Carnival’s own technical staff. Coast Guard inspectors from San Diego and San Francisco have been overseeing this process. “The level of diligence and cooperation that Carnival exhibited during this repair period, and the degree to which ship’s crew engaged with the Coast Guard at every step of the process were exemplary; they’ve clearly shown that safety has been their number one objective,” said Lt. Ken Morton, Sector San Diego Chief of Inspections. The Splendor will be accompanied by two tugs during its multi-day voyage north. The Captain of the Port, Coast Guard Capt. Tom Farris, has granted permission for the cruise ship to get underway, and has stipulated that the vessel’s movement takes place in the San Diego Channel during daylight hours. The cause of the fire is still under investigation. View the rescue efforts below. Approximately one-third of all boating fatalities occured while the victim was fishing. Likewise, more hunters die each year from drowning and the effects of hypothermia than from gunshot wounds. Many of the fatalities would have been prevented if the victim had been wearing a PFD. A number of hunters and fishermen drown each year simply because they do not act as responsible boaters. They overload the boat, stand up, don’t wear PFDs or fail to take other precautions required when boating. A person who stands in a boat does not have the same balance as someone sitting down. A person who fires a gun while standing could easily lose balance and fall overboard. DON’T operate around boaters who are hunting. Generally hunters don’t want to be around other boaters any more than other boaters want to be around those hunting from boats. As a rule, if you see someone in a boat who appears to be hunting, just keep clear. When operating around boaters who are fishing, take extra care to control your wake. People often stand up in their boat to cast or reel in a fish. Your wake could tip the boat and cause someone to fall overboard. Remember that you are responsible for your wake. If you are the boater who is fishing, remember never to anchor in narrow channels or shipping lanes and do not tie up to aids to navigation. If in an area where you can anchor, do so from the bow. Google mogul Larry Page has joined the billionaire boat owner club by splashing out $45 million on his own super yacht – but unlike many moguls, he bought his yacht used. Page picked up the 193-ft boat ‘Senses’ which comes with a helipad, gym, multi-level sun decks, ten luxurious suites, a crew of 14 and interior design by famed French designer Philippe Starck. Page, who is worth an estimated $15 billion, bought the boat from New Zealand brewing heir Sir Douglas Meyer. Meyer said Page took delivery on the mega-yacht shortly before the new year, and perhaps enjoyed the holidays on the high seas with his family. Page married model Lucinda Southworth at Richard Branson’s Necker Island in 2007, with whom he has a one-year-old son. He has visited Senses while it was docked in New Zealand over the past year and chartered other yachts around Tahiti while contemplating his purchase, Meyer told the New Zealand Herald, which first reported the purchase. But Page’s new toy is still dwarfed by those owned by other high-tech moguls, such as Paul Allen and Larry Ellison. Allen’s ‘Octopus’ comes in at 415-ft in length, while Ellison’s ‘Rising Sun’ is 454-ft long, with both costing more than $200 million. Are you an armchair inventor with a better way to keep boaters, sailors and anglers afloat? The “Innovation in Life Jacket Design Competition” is calling for out-of-the-box life jacket design entries. However, you only have until the February 1 to submit your idea. The entries will be judged based on four criteria: wearability, reliability, cost and innovation. “Wearability” relates to the level of comfort. “Reliability” will take into account the chances for potential failure, while “cost” will look at the affordability of the design. “Innovation” will take into account originality or the employment of new technologies. In early February, video of all entries will be posted online at the BoatUS Foundation’s channel at YouTube.com, and the public will be asked to select a group of finalists. The finalist entries will then be reviewed by a special panel of judges convened at the International Boating and Water Safety Summit in Savannah, Georgia, on March 6-9, 2011, and the winner announced. A $5,000 cash award goes to the winning designer. To enter, video footage of an actual working prototype must be submitted by providing a URL link to the video (no actual prototypes are submitted). The video must clearly demonstrate how the design floats a person in the water. For more information on how to enter and for contest rules, visit BoatUS.com/Foundation/lifejacketdesign. You may also contact Chris Edmonston at 703-823-9550, x8356.